April | 2014 | The Loudest Librarian! This week, in honor of Earth Day on Tuesday (April 22), I did books about nature, gardening, and recycling. An exciting thing happened though: one of my regular participants, who is now in Kindergarten, asked if she could read Biscuit Goes to School by Alyssa Capucilli aloud to the group. There were a few minutes before storytime started, so I said yes. She did an amazing job, even holding up each page so the other kids could see the pictures. Afterwards, one of my other regulars asked if she could read I Broke My Trunk by Mo Willems, so I told her she could read at the end of storytime, just before the craft. She did a wonderful job too! I was so proud of them both, for their developing reading skills, and especially for their bravery. I told them I know a lot of adults who would be too scared to read to a group like that, and it’s true. Another favorite of mine, and one my daughter has asked to hear over and over. 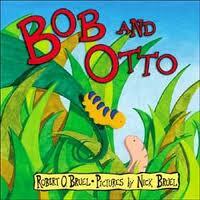 Bob, a caterpillar, and Otto, a worm, are best friends who like to play together at the base of big tree. But one day Bob decides to climb high up into the tree. Otto doesn’t want to follow. Instead he digs deep down under the tree and crawls all around the roots. When the two friends meet again, Bob has transformed into a butterfly. Otto wishes he had followed Bob, so he might have grown wings too instead of just being a “big fat worm.” But Bob tells him that all his digging is what made the tree grow leaves, so he could eat and grow wings. Sweet story about friendship, as well as the importance of earthworms. This one got snatched up at the end. 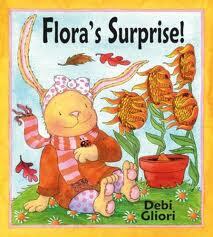 When Flora’s family plants a garden, Flora plants a brick in a pot and says she is growing a house. As the seasons pass, everyone else’s plants grow and blossom, but Flora’s house never grows. But at the end of winter, they are all surprised to find that someone (a bird) has discovered Flora’s brick, and that it has become a perfect house after all. Large, colorful illustrations and simple text make this a great book for gardening themes for toddlers on up. It was quickly snatched up too. I hadn’t thought of this as an Earth Day book until I saw it in a list somewhere, but it fits well with the “ReUse” part of the “Reduce, ReUse, Recycle” motto. 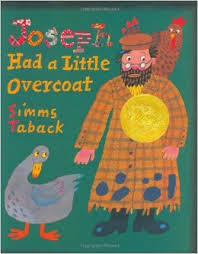 When Joseph’s coat gets old and worn, he turns it into a jacket, and then a vest, a scarf, a necktie, a handkerchief, a button, and finally…a story. The charm of this book is in the cutouts that give hints to each new thing Joseph makes. The kids loved trying to guess what was coming next. 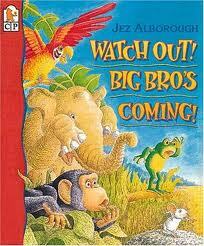 This book won the Caldecott Medal in 2000. One named Jack and the other named Jill. Fly away Jack (put one thumb behind back), fly away Jill (put other thumb behind back). Come back, Jack (bring thumb out in front), come back, Jill (bring other thumb out in front). INSTRUMENT PLAYALONG WITH A CD: I meant to play You Are My Sunshine by Elizabeth Mitchell from Sing Along with Putumayo, but that track wouldn’t play (I know from many past experiences that you should always check to make sure the song plays ahead of time, but I didn’t get a chance). Instead we did a totally random song from the same disc, although it’s a goofy one that I love: Bellybutton Song by Music for Aardvarks & Other Mammals. 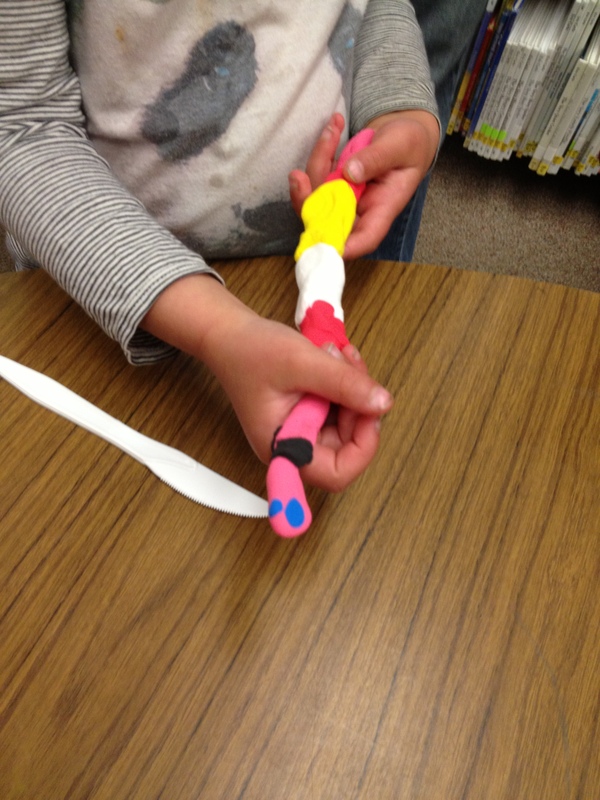 To fit with Bob and Otto, we made earthworms out of Model Magic, a nontoxic Crayola air dry clay. I mixed white and red Model Magic ahead of time to make a rosy-pink color. 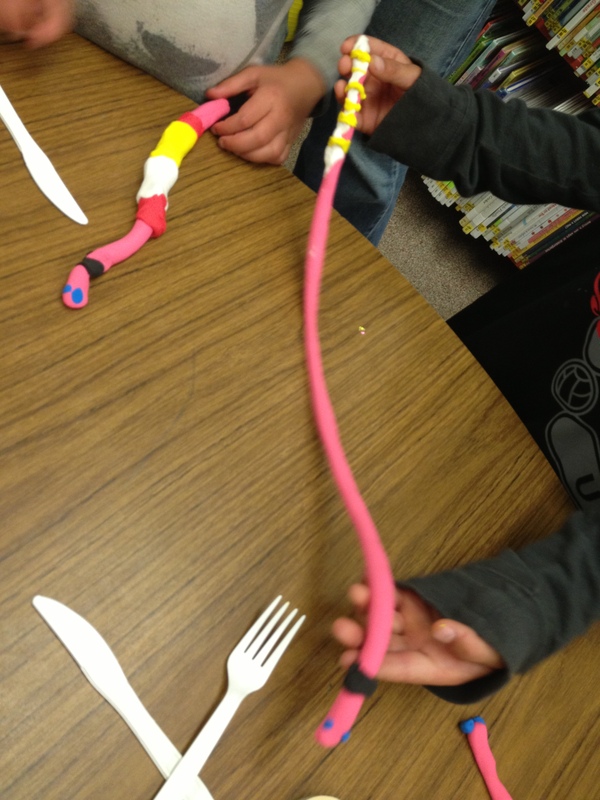 I gave each child a hunk of the clay and a plastic knife to add the little ridges in the earthworm’s body. I also put out other colors so they could add eyes. They ended up adding all kinds of things, and each worm was completely unique. Another great worm book, and one I shared with two second grade classes this week. A funny look at the joys and perils of being a worm. The kids especially loved the part where the worm gets so hungry, he eats his homework, then has to write, “I will not eat my homework” ten times, and then eats that too. The other Diary of books are great fun too. I read this one to second grade too. It’s a heavy and fairly lengthy story, and I wasn’t sure how they would take it: they were uncharacteristically quiet at the end. But several kids, mostly girls, said it was their favorite. It’s based on the Sparrow War, a true event that took place in China in the 1950’s, when Mao Zedong decreed that all the sparrows should be killed to prevent them from eating the grain. The death of the sparrows and other birds left the insects free to ravage the crops, and a terrible famine ensued. Sara Pennypacker makes this the backdrop of a story about a little girl who bravely saves seven of the sparrows, and hides them away until the farmers in her village realize the terrible mistake they have made. The second graders seem fascinating by true stories, although I was sad to have to tell them that in this case it was the more hopeful part of the story that was fiction. It is a vivid portrayal of the importance of understanding the complex interactions between every living thing, and how even small environmental changes can be devastating. 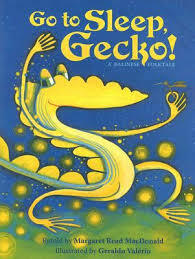 (This is the same message conveyed by Go to Sleep, Gecko in a much lighter, sillier way). Simple book about easy environmental things kids can do, and how they help the Earth: “I use both sides of the paper and bring my own bags to market because…I love the trees and I want the owls to have a place to live.” Some of the connections may not be immediately clear to kids, for example, turning off the lights and shutting the refrigerator door to help the polar bears. But it’s nice to have a concrete list of ways kids can have an impact, and the colorful, multicultural, artwork is eye-catching and fun. What are your favorite books for Earth Day? I hadn’t originally planned to read this, but at the beginning of storytime I only had two families, both with very young kids. This board book worked perfectly for them. Owen eagerly gobbles down all of the candy in his Easter basket, until he gets to the yellow marshmallow chick, which is the same color as his fuzzy yellow blanket. Will he eat it too? 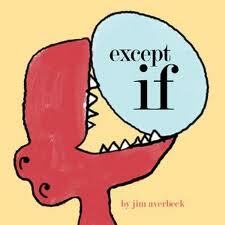 A fun book to read aloud, especially because the kids get to join in on the repeated line “Except If,” which is usually set apart on its own page. The older kids caught on quickly, and eagerly shouted it out each time they spotted it. “An egg is not a baby bird, but it will become one, except if…it becomes a baby snake.” Each page shows a different possible outcome: the egg might actually hold a lizard, or a dinosaur. Except if…it actually becomes a baby bird. 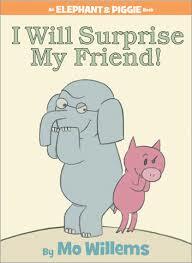 Another great Gerald and Piggie book. In this one, Gerald is disturbed to discover that he has a bird on his head, and even more disturbed when another bird arrives, followed by a nest, and three eggs. This book got lots of laughs, even from kids who had clearly heard it before. The first time I checked this book out, my daughter demanded to hear it three times in a row. And when I had it in my stack at storytime, one of the Kindergartners pulled it out and said, “Oh! Read this one!” It is a fun story, with hilarious illustrations. When a boy finds an egg lying in the middle of a path near a pond, he puts it in an empty nest in a nearby tree. Mr. and Mrs. Bird are surprised to find it there, but kindly decide to care for it, even though the baby that eventually hatches from it is like no bird they’ve ever seen (he’s an alligator). Thankfully he doesn’t eat his adoptive parents, who keep him well fed until it’s time for him to fly from the nest… This one was quickly snatched up at the end. One little bird got a wormy from his mum. Gulp it up! Slurp it down! Yum! Yum! Yum! (Repeat with two little birds, and then one). My son did this craft in preschool many years ago, and it’s always been one of my favorites. I cut diamond shaped beaks out of orange paper, and little feet (these were triangles with the point cut off, and tiny triangles cut in the wide end to make a W shape). 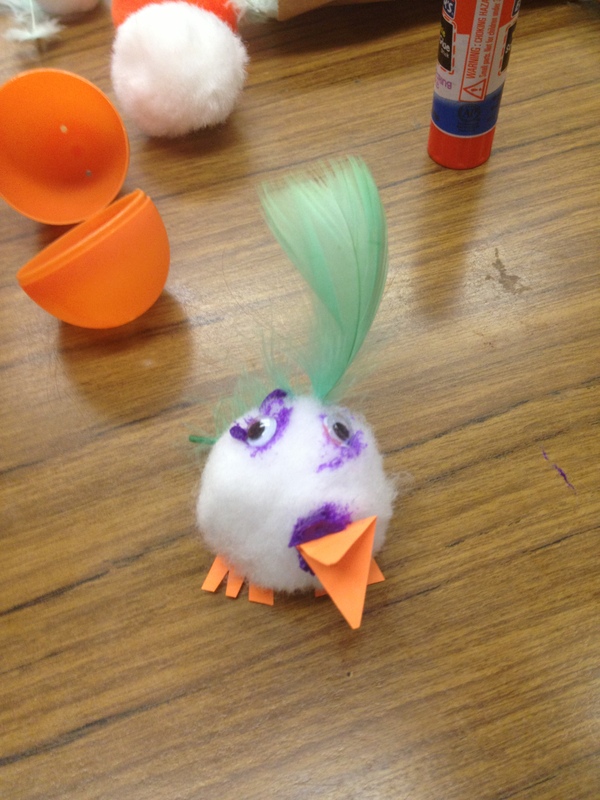 Then I gave them to the kids along with pom-poms, wiggly eyes, glue and glue sticks, feathers, and plastic Easter eggs. 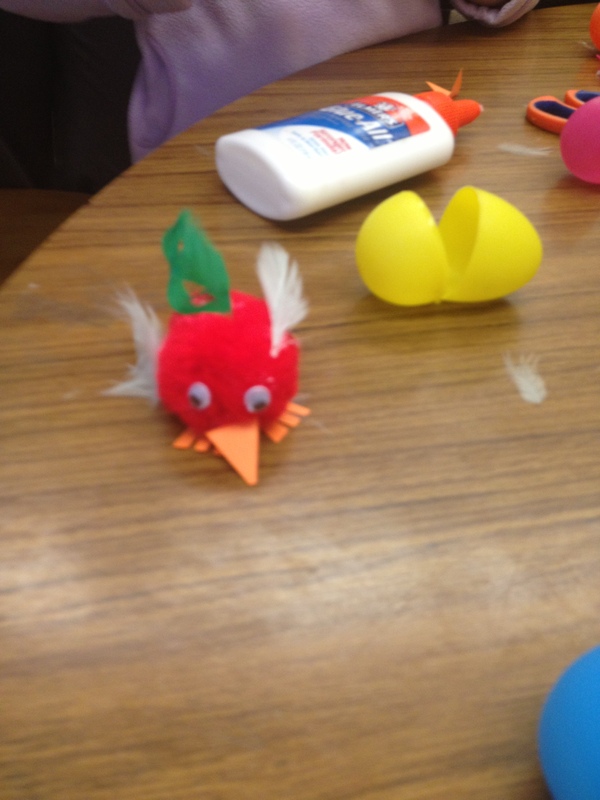 (The feathers make it harder to fit the finished chick inside the egg, but they are very cute). 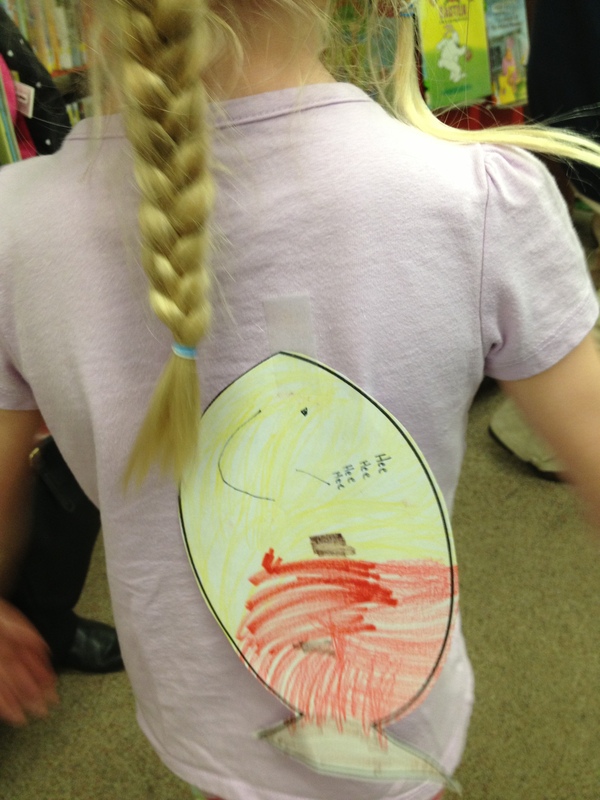 One girl asked for stickers to decorate her egg, so I brought some of those out as well. The glue sticks worked pretty well for holding things on, but you have to rub them hard against the pom-pom. I meant to read this nonfiction book, because it is beautiful. Every page shows different types of eggs, all in brilliant colors, while describing various characteristics of eggs: eggs are quiet, eggs are colorful, eggs are shapely. It also includes a brief description of the parts of an egg, and how the protect and feed the embryo inside. The last page shows all of the different creatures who hatched out of the eggs. The illustrations in this book are so striking that when I read it to my daughter, she wouldn’t let me turn the page until we had talked about every single egg. A fun, simple story by Margaret Wise Brown (Goodnight Moon), that is perfect for Easter because it includes an egg and a bunny. When a bunny finds an egg, he tries everything he can think of to make it hatch: kicking it, jumping on it, and rolling it down the hill. He is so worn out from his efforts that he falls asleep…and the egg hatches. Another great nonfiction title that is simple enough for preschoolers. 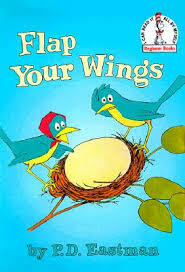 This book describes, in rhymed verse, all of the different creatures that hatch from eggs. A cute easy reader that also works well for storytime. 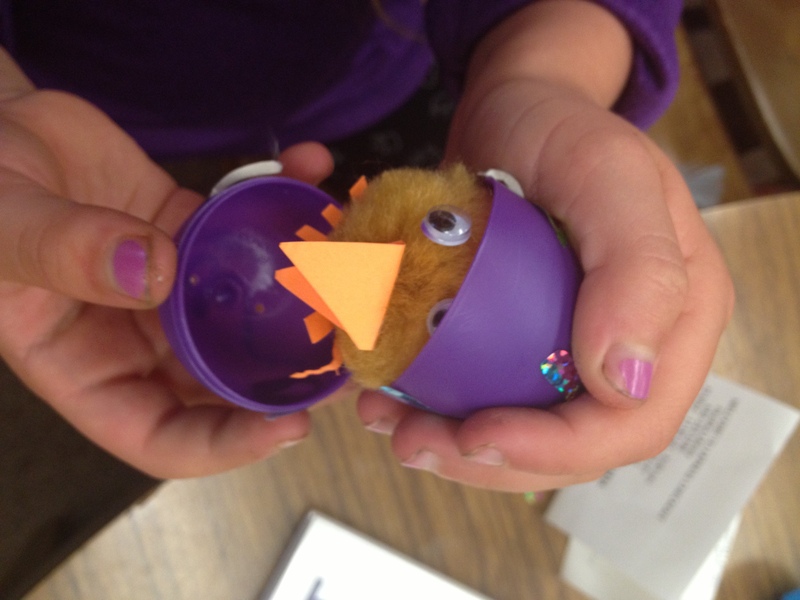 When Daniel finds an egg, all of his friends take turns guessing what kind of animal will come out of it: a duck? an ostrich? an alligator? But they are all in for a surprise. What are your favorite books about eggs? This was one of the most gratifying read-alouds I’ve ever shared with a group. It’s a series of riddles, with clues, rhymes, and silhouettes that all seem to be leading to an obvious answer, only the solution is always something completely unexpected. For example: He steals carrots from the neighbor’s yard./His hair is soft, his teeth are hard./His floppy ears are long and funny./Can you guess who? That’s right! My…Grandpa Ned! This worked incredibly well for second grade because they were so certain they knew the answer, and they exclaimed so loudly each time the real answer was revealed. The first class made me read it twice, so they could all shout out the real solutions. 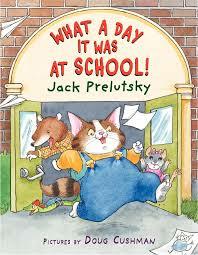 Jack Prelutsky is a genius at children’s poetry, with a gift for humorous twists along the lines of Shel Silverstein. In this collection, a cat describes his school day to his mother, with different poems describing how his science homework dog, how he accidentally started a food fight at lunch, and even how he farted in class. In the last poem, he has to write a poem for class that has to have meter and rhyme, which gave me an opportunity to talk about meter in poetry. This is an amazing and beautiful book. Each page features a different fairy tale: Cinderella, Rumplestiltskin, Sleeping Beauty, etc. And each is actually two poems: the first poem reads normally, from top to bottom; the second takes the exact same poem but flips it, as if you were reading it from bottom to top, where it takes on an entirely different meaning. For example, for Red Riding Hood, the first poem is from the girl’s perspective: In my hood, / skipping through the wood, / carrying a basket, / picking berries to eat — / juicy and sweet / what a treat! / But a girl / mustn’t dawdle. / After all, Grandma’s waiting! The second poem uses the same lines in reverse to show the wolf’s point of view: After all, Grandma’s waiting, / mustn’t dawdle… / But a girl! / What a treat — / juicy and sweet, picking berries to eat, / carrying a basket, / skipping through the wood / in my ‘hood. 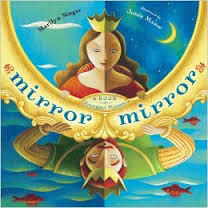 The kids especially loved the illustrations, which mirror the way one thing transforms into another: the wolves legs becoming the trees in the forest, the seven dwarves’ mine becoming the evil queen’s face. A brilliantly executed poetry collection that could make for a fun, and challenging poetry assignment. The second graders were mesmerized. 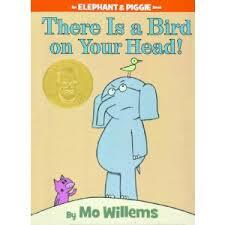 I read this to some second grade classes last year, and it was a huge hit! Each poem features the woes of a different monster: the Phantom of the Opera can’t get It’s a Small World out of his head; Count Dracula has spinach in his teeth; Big Foot is tired of being mistaken for the Yeti. Very funny and off-the-wall. A great book to illustrate how writers can use words to mimic sounds or experiences, in this case Charlie Parker’s jazz rendition of A Night in Tunisia. I’ve read this book so many times to both of my kids that I can almost recite it from memory, and it’s a blast to read aloud: Be bop. Fisk Fisk. Lollipop. Boomba Boomba The language captures the play and joyful unexpectedness of jazz music. A rhythmic poem describing 17 kings and 42 elephants walking through the jungle. It’s fun to have the kids clap or stomp along with the beat, which is infectious. What are your favorite poetry books for kids? Yet another terrific Gerald and Piggie book, and one that worked perfectly for this theme. When Gerald and Piggie see two squirrels playing a game where they try to scare each other, they decide to try it on each other. This book always gets big laughs, especially on the page where Gerald and Piggie jump out at the same time and scream in terror. 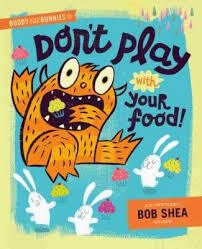 Bob Shea is another favorite picture book author of mine. 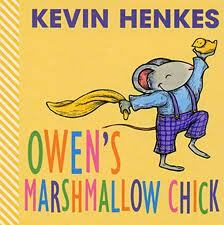 I learned about this new title of his from my friend Kerri’s blog, MLReads.com. Buddy the monster really wants to eat the adorable little white bunnies, but somehow the bunnies always manage to divert him onto something else: making cupcakes, going swimming, or going to the fair. Hilarious read-aloud that always gets groans and laughs at the punchline. Shake My Sillies Out: My standard opening song. I always pretend to fall asleep in the “Yawn my sleepies out” verse, and the kids yell, “Wake up!” Here’s a video of the original version by Raffi. (D) In the moon, (A) in the moon. And his (D) name was (A) Aiken (D) Drum. He played upon a ladle, and his name was Aiken Drum. His nose was made of cheese…. His hair was made of spaghetti… etc. There’s a Spider on the Floor: I have a big spider puppet that I brought out for this one, and I carried it around to put lightly on each kid’s leg, neck, head, etc. I’ve changed the verses a little from the Raffi version. Instead of “There’s a spider on your stomach,” I do “There’s a spider on your tummy, on your tummy…Oh, you look so very funny, with that spider on your tummy.” And instead of “I wish that I were dead, I’ve got a spider on my head,” I sing, “Oh, it fills my heart with dread to see that spider on your head…” But otherwise I keep it the same. Little Bunny FooFoo: Great song for getting the kids on their feet and jumping around. Here’s an animated video by Hannah Heller with the lyrics. An incredibly simple craft based on the French tradition of sticking paper fish on people’s backs on April First as a joke (Poisson d’Avril). You can read more about the history on FranceTravelGuide.com. 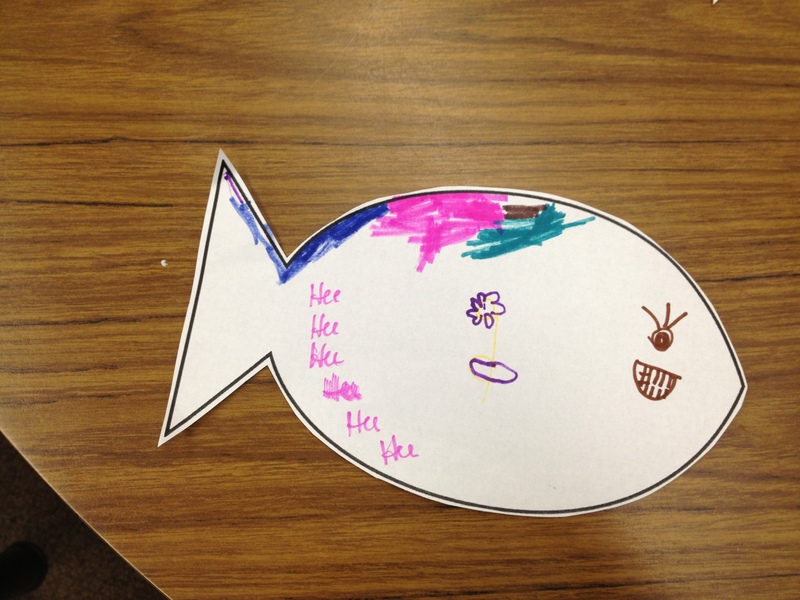 For the fish, I printed out a basic template from AllKidsNetwork.com, and gave the kids markers and crayons to decorate it, and tape to make it sticky. They had the best time trying to stick the fish on each other and on all the grown-ups. One of the best examples of a trickster tale, featuring Anansi the Spider, the mischievous West African god. When Anansi discovers that a certain rock in the jungle knocks people unconscious when they say, “Isn’t this a strange moss-covered rock?”, he uses it to trick all the other animals and steal their food. But all the time, Little Bush Deer is hiding and watching, and planning a trick of her own. This is a terrific read-aloud. Kids love joining in on the “KPOM!’s” whenever an animal falls for the trick. Plus Janet Stevens has cleverly hidden Little Bush Deer on almost every page for kids to find. The classic classroom story about sweet Miss Nelson, who is mysteriously replaced by the evil Miss Viola Swamp. The best thing about this book is the way it leaves it up to the reader to solve the mystery. I also love that James Marshall based his depiction of Miss Viola Swamp on his own horrible second grade teacher who laughed at his drawings (you can read about it in this Horn Book interview). I have also read that Marshall gave up drawing for years afterwards. Thank goodness he regained his confidence as an adult! He certainly had the last laugh. 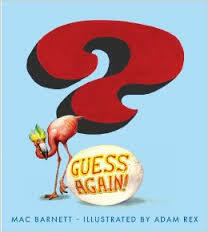 What are your favorite picture books about jokes and tricks?